Sign up and receive Property Email Alerts of Houses for sale in Mullersrust, Sasolburg. 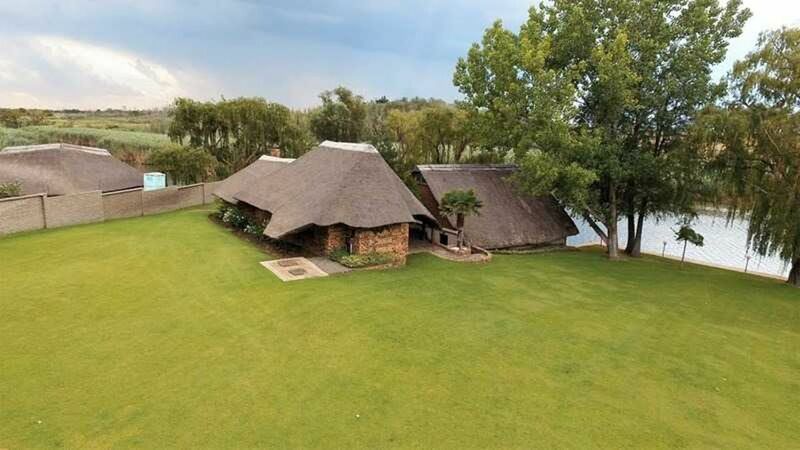 Set within a tranquil tributary near Millionaire’s Bend, this magnificent Gentleman’s Private Estate offers the best the Vaal offers. Within a guarded security enclosure, the manicured property measures 4.45 Hec, offers springbuck and horse facilities. Numerous waterfeatures, koi dams and ponds and waterfalls set the scene upon entering. The extensive (1200m²) homestead offers an impressive entrance spilling to numerous formal and informal living spaces, designed for entertainment in mind. Basement bespoke cellar and billiard room / bar. Gourmet catering kitchen and outdoor kitchen. 7 Double bedrooms, 5 bathrooms, 2 studies, gym, sauna, Jacuzzi. Riverside entertainment pavilion for 40+ people with tennis court, braai, bar and entertainment facilities. Garaging for 5 cars, boatshelters for 3 and 2 riverside boathouses and lift. Generator. An exceptional property. Sign-up and receive Property Email Alerts of Houses for sale in Mullersrust, Sasolburg.